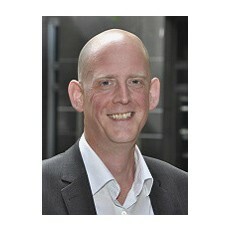 Are sky-high valuations in M2M/IoT good news for the industry? By Matt Hatton, Founder & CEO, Machina Research. At its annual PTC Live event in Boston in May, the company announced the acquisition of data analytics firm ColdLight. This USD110 million purchase comes on top of two other very prominent deals in the last eighteen months in the IoT field, specifically the acquisition of ThingWorx (USD112 million) and Axeda (USD170 million). Overall, PTC has made almost a half billion dollar bet on the Internet of Things. Ultimately we think the value of such investments to PTC as a whole will pay dividends, but the amounts of money are certainly eye-catching. In May 2015 Machina Research undertook a set of research looking in some detail at mergers, acquisitions, investments and valuations in the IoT sector. The aim was to determine if there were any significant trends that might influence the growth trajectory in the market. This article provides a summary of some of the findings of that research, which will soon be available to Machina Research subscribers in the Research Note “Sky-high multiples in company valuations will have negative repercussions for IoT growth”. In particular we focused on the revenue multiples that are being commanded in some recent acquisitions in the space (as illustrated in Figure 1). For context, the combined revenue of the PTC acquisitions is somewhere around the USD40 million mark, giving a combined multiple of 10 times revenue. A number of trends emerge. Firstly the multiples on revenue at the top of the chart are substantial, with the biggest registering at one hundred times revenue, and a number of deals at well above ten times revenue. However, there is a broad span. At the bottom of the chart one deal that we analysed saw a multiple of only a little more than one times revenue. So there is high degree of diversity in the multiples being commanded in IoT. 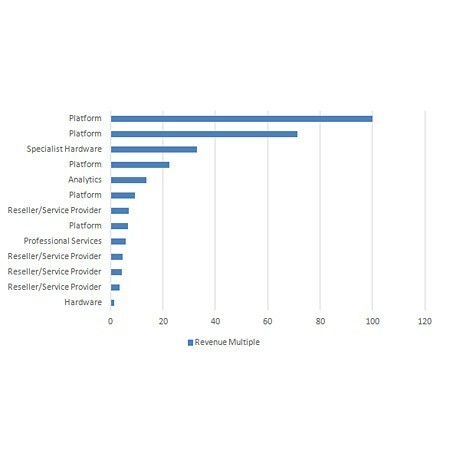 It is also notable that the top end of the chart is dominated by software platforms, while the bottom end tends to focus on the hardware and service provider space. The dynamic here is easy to determine: software platforms are typically high growth, horizontal and scalable, whereas the service provider and hardware businesses are more mature, lower growth and hard work. As explored in the forthcoming Research Note, the high multiples commanded for IoT companies is a vote of confidence for the space, but will have some negative repercussions. The sector risks obsessing about valuations rather than delivering value to customers, in particular hand-holding enterprise customers through the IoT process. It also limits the opportunity for market consolidation, which we believe is a necessity. Someone like PTC has forced the issue, combining three complimentary entities, but it has had to spend USD400 million to do so. We believe that a number of deals that might have made sense from a strategic standpoint are rendered impossible by the costs involved. This is bad news for any company that wants to expand inorganically, but therefore inevitably good news for any company that has grown a full service offering organically as the barriers to entry are high. Last month Machina Research published its forecasts for the IoT space: USD4.3 trillion by 2024. So our view is firmly that IoT has enormous growth potential and opportunities aplenty. However, we believe that some of the valuations, of fifty or one hundred times revenue will create some unhelpful dynamics in the sector which won’t ultimately help with driving the market forward.